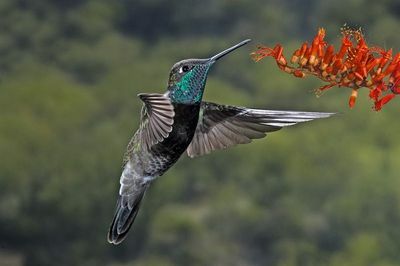 The Magnificent Hummingbird (Eugenes fulgens) is a large hummingbird that breeds in mountains from the southwestern United States to western Panama. This bird inhabits the edges and clearings of montane oak forests from about 2000 m to the timberline. The male Magnificent Hummingbird is unmistakeable. Female is similar to female Blue-throated Hummingbird but lacks large white tips to tail and white malar streak. Other hummingbirds are much smaller. Food: The food of this species is nectar, taken from a variety of flowers. They also eat some small insects. Magnificent Hummingbird males perch conspicuously and defend their feeding territories aggressively. A little bird wants, Arabian proverb, Eugenes fulgens, Magnificent Hummingbird. Bookmark.